As a geek parent, I, for the most part, have been unsuccessful in passing on my enthusiasms to my teen and tween daughters. Sure, my eldest is now a confirmed Potterhead, but only years after her mother and I bequeathed her our books, which she refused to read because they were ours. She discovered and fell in love with Stranger Things on her own, too, which I guess is what works with her — if we’d told her to watch it, maybe she wouldn’t have listened. 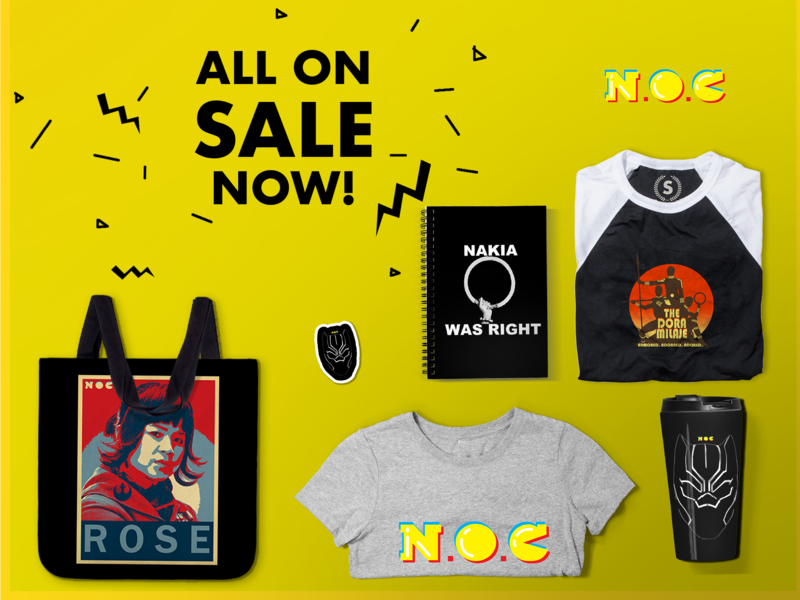 Her younger sister is a bit more open to my suggestions, and loves anything with magic and the fantastic, and she happily displays my gifts of Pop! figures of strong female characters on her shelf. However, she scares very, very easily, so attempts to watch Star Wars movies, for example, are interrupted by frequents runs out of the room or outright refusals, no matter how much likes likes the characters. 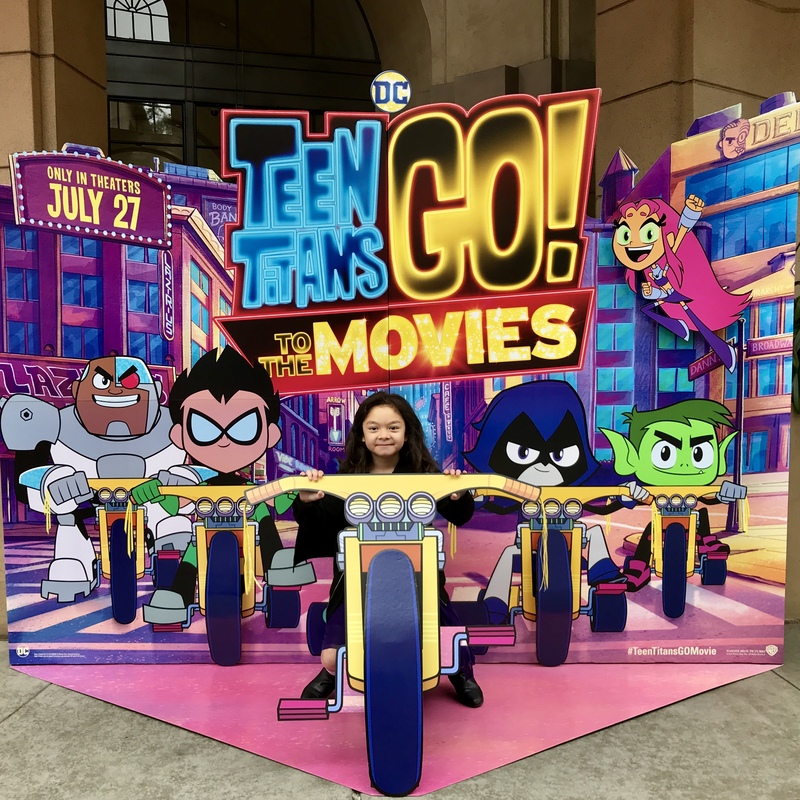 Teen Titans GO!, Cartoon Network’s irreverent, joke- and music-filled take on the off-duty life of a diverse adolescent team, has been an awesome, painless introduction to the on-screen world of comic book superheroes, one that my youngest doesn’t have to run out of the room from, with her hands over her ears. 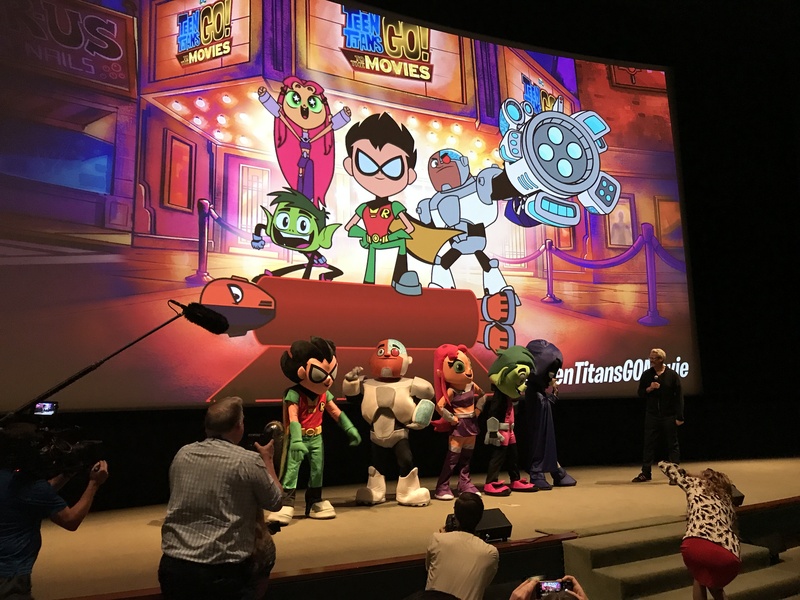 So when we were asked to rep the NOC at a family press screening of Teen Titans GO! To the Movies, the show’s first big-screen outing, all of us, even big sister, were happy and excited to go. Plot-wise, the movie finds Robin jealously coveting the respect and status that having a movie about oneself connotes, and tired of being laughed at by the likes of the Justice League, he and his teammates seek out an arch-nemesis in order to merit a movie of their own. Along the way, there are bodily function jokes galore, callbacks to the TV show (pancakes, anyone? ), and insanely catchy musical numbers like Robin’s narcissistic daydream “It’s My Movie (My Movie, My Superhero Movie)” and the Gen-X parent-service ode to ’80s movie conventions that is “Upbeat Inspirational Song About Life.” And just like that song, which is chockful of poking-fun-because-we-love-it references to the pop culture the parents of the movie’s target audience grew up with, the film is peppered with nods and jokes that will operate on a whole other level for the grown-ups in the audience. From failed Superman Nicolas Cage voicing the Man of Steel and jokes at the expense of Green Lantern, to light-hearted jabs at genre conventions like cross-publisher character similarities and good villain names (big bad Deathstroke is never referred as such, only as “Slaaaaaaaaaade” — when he’s not called Deadpool, that is), the movie is full of winks and nods just for the grownups. 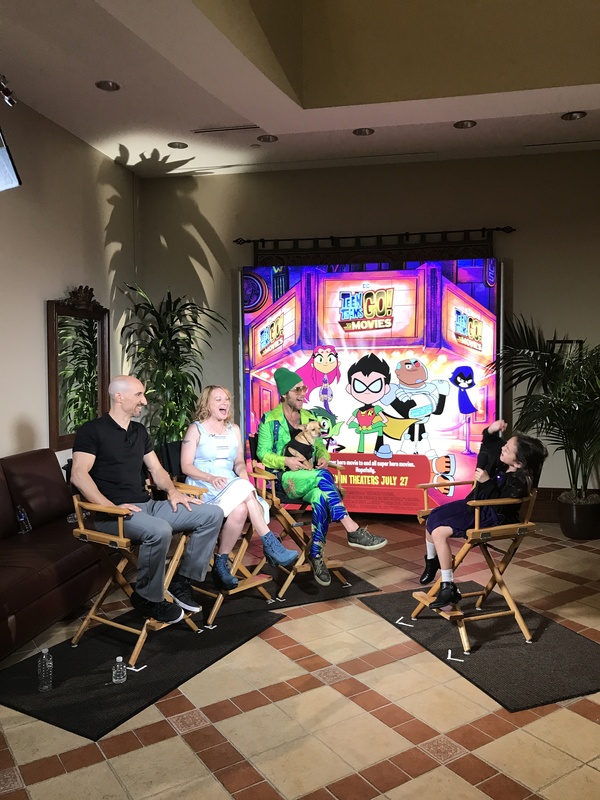 Speaking of which, the family press event afforded nine-year-old Emi the opportunity to speak with the voice actors behind Starfire, Beast Boy, and Robin, and to experience what it’s like to do ADR recording for animation, and she repped the NOC well. 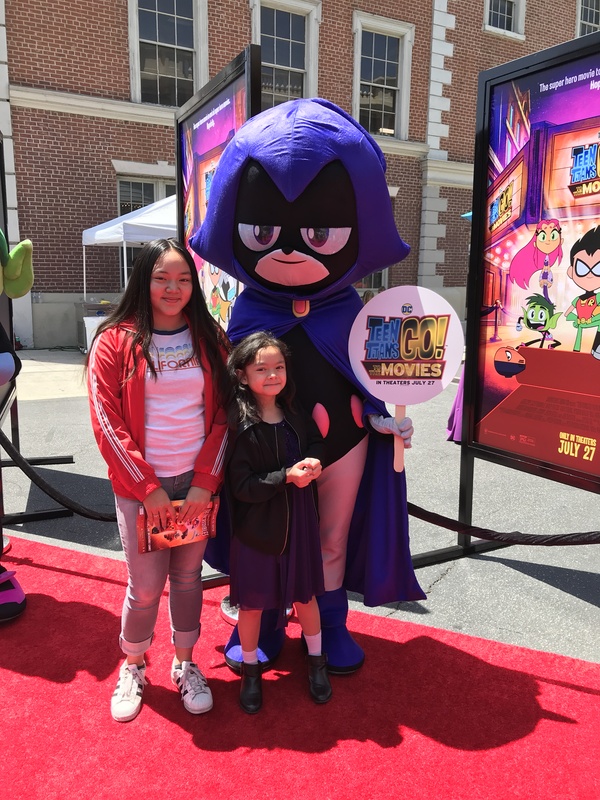 She dressed in purple to evoke her fave, Raven, not coincidentally voiced by Twilight Sparkle of My Little Pony: Friendship is Magic, Tara Strong, and she loved walking the red carpet. In the ADR room, she choice to dub Raven, natch, and the experience only reinforced her desire to do this (or some other form of acting and performing) for a career. After, when she got to interview three of the voice actors, including a creatively dressed Beast Boy (with his dog), all three of whom went in and out of character during the interview, Emi asked them for advice on this career goal. She was very happy when they all told her hone her craft by doing musical theater. All in all, it was a great day celebrating a fun family movie. Teen Titans GO! to the Movies is a giant, loving poke-in-the-eye at superhero movies and the nerdy pop culture world they helped spawn that we now live in. It’s something that kids and their parents can enjoy together and on different levels. And yes, it’s full of fart jokes and musical numbers, but it’s fun, and it’s funny, and it’s the exact opposite of dark and tortured, and it may just be the superhero movie our families need right now. I’m not really a fan of Teen Titans Go ..at all.. but the movie does look super cute and funny.